Karin Nicole Sowada was born in Sydney on 1 November 1961, the daughter of migrant parents: Helen, born in England, and Valentin, a Swiss photojournalist. Her parents had first met in Sydney in 1957. By Sowada's own account, while her parents were not involved in party politics, they 'were intimately concerned with political issues', which were discussed around the table at night. In 1975 the fourteen-year old Karin had 'a raging argument with my friends' over the dismissal of the Whitlam Government. Raised, educated and resident in Sydney's eastern beach suburbs, Sowada described her teenage self as 'deeply influenced by the public school "surf culture" of Bondi and Coogee', as encapsulated in the film Puberty Blues. She was also ambitious: her early aspirations were directed towards politics, law and archaeology. After her education at Bronte Public School and Randwick North High School, she worked as a attendant (or strapper) at the local racecourse and as an insurance clerk. At only twenty-one, she operated her own insurance agency, specialising in bloodstock and livestock insurance; she later worked for various broking firms handling fire and general insurance for small commercial clients. In 1982 Sowada joined the Australian Democrats. She was, she said, 'full of ideals, enthusiasm and more schemes than a dog has fleas'. The Democrats attracted her interest because of their propensity for long-term policy making, the party's internal processes which enabled members to have a direct say in policy matters, and their early interest in the environment. The party's encouragement of female candidates was a further incentive. The Democrats quickly recognised the potential of their young recruit, and endorsed her for the marginal House of Representatives seat of Phillip in three consecutive elections in 1983, 1984 and 1987. Sowada never came close to winning the seat, but increased her vote on each occasion. 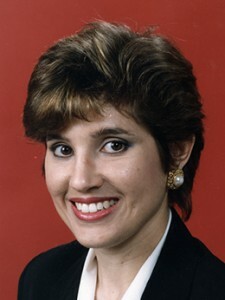 She was placed second, behind Vicki Bourne, on the party's New South Wales Senate ticket at the 1990 federal election. Bourne was elected, but Sowada was again unsuccessful. In between running for Parliament and serving the local Democrats branch in various administrative positions at local and state level, Sowada completed an Arts degree at the University of Sydney, majoring in archaeology and politics and graduating with first-class honours in 1989. Archaeology gave her a sense of perspective. In her first speech as a Senator, she told a poignant tale of finding skull fragments dating from several thousand years before Christ: 'a skull which had once enclosed a brain, thoughts, hopes, aspirations and emotions' but was now reduced to fragments. 'One's own sense of self-importance is rapidly deflated when confronted with the stark reality of human history in one's hand'. Sowada's metamorphosis from perennial political hopeful and good soldier was precipitate. When Democrats Senator Paul McLean resigned on 23 August 1991, Sowada, as the next candidate on the NSW AD ticket at the previous election, was nominated by the party to replace him, and she was appointed by the NSW Parliament on 29 August. Just six weeks earlier, on 13 July 1991, she had married Armon Hicks, a former Democrats staffer. At the time she took her place in the Senate, Sowada, a few months shy of her thirtieth birthday, was Australia's youngest-ever female senator. Like all AD senators, Sowada found herself as spokesperson for numerous portfolios, which included, at various times, education and training, youth, industry, science and technology, tourism and the Australian Capital Territory. Early in her parliamentary career she went against the general feeling in her party when she voted with the Liberals against a move to ban paid electronic political advertising during elections. She argued that the only reason that the ALP Government pursued the policy was 'to curb the burgeoning debts of the Labor party'. Shortly after entering Parliament, Sowada had attracted the ire of Democrats founder Don Chipp, who threatened to quit his life membership when she suggested the party might support the government's industrial relations legislation enshrining unions' right to strike. The new senator clarified the Democrats' position and soon afterwards was relieved of the industrial relations portfolio. Sowada's period in the Senate coincided with high rates of youth unemployment. She called for a youth summit to address the problem, one that would include 'not just articulate opinion leaders' but young people in 'very desperate straits' from areas such as the western suburbs of Sydney. As a member of the Standing Committee on Employment, Education and Training, she played a leading part in initiating the committee's youth unemployment inquiry, during which 'the young people of Australia ... actually had an opportunity to put their views'. The committee's report, titled Wanted: Our Future, was unanimous across party lines, and Sowada regarded her contribution to this inquiry as 'perhaps my most important work'. Another consequence of Sowada's commitment to youth issues was her close and informed interest in tertiary education. Sowada argued the case for compulsory student unionism and expressed concern about the funding problems facing universities. She accused the Keating Government of taking an 'economic rationalist view of education' and declared: 'Education is not a revenue raising measure ... it is a guiding light that leads to a more democratic and inspired society'. Sowada was dismayed by the government's introduction of a student loan scheme late in 1992. Describing the legislation as a further step in 'the entrenchment of user pays education', she concluded: 'The Labor Government has sold out students and has sold out education'. Next year, she observed that during her time in the Senate, Parliament had been given 'very little opportunity' to examine and comment on education policy: 'I believe that is a very serious development because it means that policy and actions are developed by bureaucrats and sanctioned by Ministers, and we are left to simply examine the crumbs'. Sowada spoke against the import and export of radioactive waste in and out of Australia, and maintained a watching brief on the activities of the Australian Nuclear Science and Technology Organisation (ANSTO), which was responsible for the Lucas Heights nuclear reactor. When enacted the Australian Nuclear Science and Technology Organisation Amendment Act 1992 confirmed ANSTO's right to engage in the conditioning, management and storage of radioactive materials and radioactive waste (this had recently been challenged in the NSW Land and Environment Court), enabled ANSTO to engage in commercial activities, and guaranteed ANSTO exemption from certain state and territory laws, particularly environmental and planning legislation. She was highly critical of the bill, accusing the Commonwealth of 'riding roughshod' over state and local environmental laws. She moved a number of amendments, the majority of which were unsuccessful, and introduced a private senator's bill, the Radioactive Waste (Regulation of Exports and Imports) Bill, which proposed making illegal the export or import of radioactive waste. The bill did not progress beyond the second reading debate. Although Sowada hoped for at least one full term in the Senate, it was not to be. The 1993 election was a disaster for the Democrats, their senatorial vote in NSW plummeting from 11.79 per cent in 1990 to 4.92 per cent. After a protracted count, Sowada—second on the Democrats ticket behind the successful Bourne—lost the final spot in the Senate to the National Party's Senator J.A.L 'Sandy' Macdonald. In her valedictory speech on 27 May 1993 Sowada accepted the election result 'without bitterness and rancour'. Her puckish sense of humour came into play as she addressed the Senate for the last time. She looked forward—or so she said—to 'experiencing education at the coal face of the Dawkins reforms', including inadequate libraries and research facilities and shrinking funding. Of her future field work she said: 'rather than watching Government Ministers dig holes for themselves, I shall return to the desert sands of Egypt and the great tells of Jordan to dig holes of my own'. In her brief Senate career, Sowada spoke 148 times and gave thirty-three notices of motion. This level of activity caused the Leader of the Government in the Senate Gareth Evans to comment that Sowada 'has, single-handedly, over the last two years caused more distress to the Government than nearly all her colleagues put together'. Sowada made a brief return to the forefront of politics at the 1998 Constitutional Convention, which she attended as an elected delegate who supported the Australian Republican Movement. She supported the option of a head of state appointed by a two-thirds majority of Parliament, and not one directly elected by the people because a direct election 'would have the outcome that those who are fed up with politicians would dread—a politician would certainly end up in the job'. After the convention, she was a member of the official committee for the unsuccessful 'Yes' case in the 1999 referendum on the republic. Following her departure from the Senate, Sowada returned to academic life. She worked on Egyptian (and occasionally Jordanian) archaeological sites, and as a writer, researcher, media commentator and lecturer, presenting and publishing archaeology in both academic and popular formats. She was assistant curator of the Nicholson Museum, a repository of artefacts from the ancient world at the University of Sydney, from 1996 to 2005 and was co-editor of two books on the museum. In 2002 Sowada was awarded a doctorate by the University of Sydney for her research into Egypt in the eastern Mediterranean during the Old Kingdom period (the 3rd millennium BC); her thesis was published in Switzerland in 2009. Sowada left the museum in 2005, and together with her husband ran Capitol Research, a public affairs business which represented a number of companies, including Lion Nathan and the St George Bank. She had served as a principal consultant for the firm between 1993 and 1996. In 2008 Sowada became the CEO of the Sydney-based Anglican Deaconess Ministries Limited. In her first Senate speech she declared that she was 'a regular churchgoer', but never unduly stressed her religion in her political speeches and activities. Karin Sowada continued to live in Sydney with her husband and their two children. Workshop presented by Karin Sowada, 'Getting Women into Politics', Syd., 6 Feb. 1993, pp. 31–3; CPD, 9 Oct. 1991, pp. 1675–79. CPD, 3 Dec. 1991, pp. 4042–6, 19 June 1992, pp. 4133–6, 27 May 1993, pp. 1553–6, 2 Dec. 1992, pp. 4076–7, 26 Nov. 1992, pp. 3604–5, 13 May 1993, pp. 585–7; Sunday Age (Melb. ), 22 Sept. 1991, p. 9. CPD, 7 Oct. 1992, p. 1305, 25 Nov. 1992, pp. 3416–22, 27 May 1993, pp. 1553–5; Debates of the Constitutional Convention, 5 Feb. 1998, p. 313–15. This biography was first published in The Biographical Dictionary of the Australian Senate, Vol. 4, 1983-2002, Department of the Senate, Canberra, 2017, pp. 120-123.